We always start out with the best of intentions, but sometimes we forgot to give our dogs their flea treatments on time. Wouldn’t it be nice if there was a flea treatment that lasts for an extra few days, for those occasions when you forget? There is actually one flea treatment that lasts for 35 days instead of the usual 30: Simparica. This flea treatment starts working within three hours of being administered, and its effects last longer than most other treatments. This is a great product for dogs that are allergic to flea bites, and dogs with flea allergies have demonstrated significant improvement when they are put on Simparica. Simparica is a flea treatment with sarolaner as its active ingredient, for dogs and puppies six months and older, and weighing more than 2.8 pounds. This ingredient stops the neurotransmitter gamma aminobutyric acid (GABA) receptor from functioning, along with the glutamate receptor, and affects the neuromuscular junction in fleas, which leads to their death. This treatment only needs to be administered once monthly, and if you miss a dose by a few days, your dog will likely still be protected. Simparica can be given orally, or you can crush it up and mix it in with your dog’s food. Simparica not only controls fleas on your dog but also helps to minimize the risk of a flea infestation in your home. It kills fleas before they have a chance to lay any eggs. For the best results, make sure that all pets in the home are treated with an appropriate flea treatment. 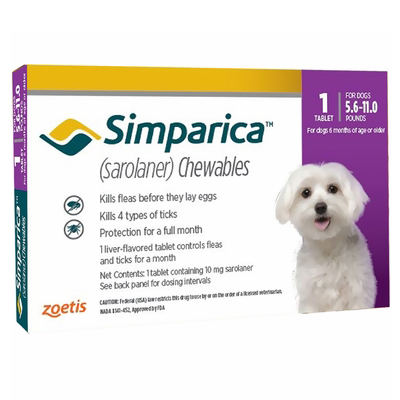 Simparica is not for cats or other pets, just for dogs, but there are many treatments for all types of pets. When administered for three months consecutively, Simparica can provide a 95.6 percent reduction in adult fleas in the first two weeks, and by the end of the three months, the fleas are completely gone. One of the most widespread health hazards for dogs (and public health hazards) is ticks, so you need to give your dog a medication that prevents both fleas and ticks. Not only can Simparica keep your dog free of fleas, it also kills ticks within eight hours of being administered. Ticks carry deadly diseases, so you will have the peace of mind in knowing that if a tick does get on your dog, it is going to die. Simparica is 96.9 percent effective in keeping ticks away for 35 days. It will eliminate infestations of deer or black-legged ticks, lone star ticks, Gulf Coast ticks, American dog ticks, and brown dog ticks. When administering this medication to your dog, make sure that the entire dose is ingested. Watch your dog for a few minutes after giving them this medication to make sure that it does not spit it out. This medication is for dogs only, and should not be given to other pets. If you have cats or other pets, talk to your vet about the appropriate flea and tick treatments. Also, this is not meant for human consumption and should be kept well out of the reach of children. Do not use Simparica on dogs that are breeding, pregnant, or lactating, as there are no studies showing if it is safe to do so. There are some known side effects, which are rare, but that you need to be aware of. Some adverse reactions to Simparica include tremors, decreased awareness of body movement, loss of control over bodily movements, problems blinking, and/or seizures. If you think that your dog has had an overdose of Simparica, contact your vet immediately to seek treatment. If your dog is on any other medications, you don’t have to worry about any negative interactions between Simparica and other drugs. There are no contraindications for using Simparica with other medications. Not only are fleas and ticks dangerous for your dog, they are also dangerous to humans, and the last thing you want is an infestation of either in your home. Treating your dog with Simparica is safe and easy, and it will ensure that fleas and ticks cannot invade your home and bite you or your family members, as well as other pets. It is important that you continue to administer treatments monthly in order to make sure that there are no future flea or tick infestations. If you have other pets, make sure that they are also treated, with medications that are meant for them specifically.